We have been writing about the ancient Egyptian expression “The Hand in the Mouth” (Djat Ra) as a way in Egyptian language of referring to the gesture made by the mother breastfeeding her baby. In the funerary sphere of Ancient Egypt that expression seems to be related to the mourning rite made by the professional mourner during the Opening of the Mouth ceremony. The dead, assimilated to a new-born, would need this gesture as a symbol of his first feed for the Hereafter. But in the relief from the tomb of Qar, this movement of approaching the hand to the mouth was also made by the embalmer. The expression Djat Ra related to a masculine figure cannot have a maternal explanation. 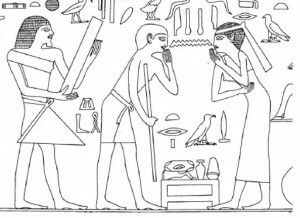 Looking at some depictions of the Opening of the Mouth ceremony from the New Kingdom we can see how, among the many practices made in favor of the deceased in Ancient Egypt, there is one in which the funerary sem priest opens the dead’s mouth (or the statue’s dead mouth) with his little finger. Sem priest opening the mouth with his little finger. Tomb of Rekhmire. Had this ritual gesture made on the corpse or on the statue a resurrection purpose in Ancient Egypt? To open the mouth in the ancient Egyptian funerary thought was necessary for granting the new life to the dead. In the real life it is something closely related to the first moment of life of a new born. As A.M. Roth says: “at birth the baby’s mouth is obstructed by mucus that must be cleared before the baby can breathe” (Roth, A. M. “The pss-kf and the Opening of the Mouth Ceremony. A Ritual of Birth and Rebirth”, JEA 79, p.63) and usually doctor after the cut of the umbilical cord, puts his little finger into the mouth of the child for detecting abnormalities. 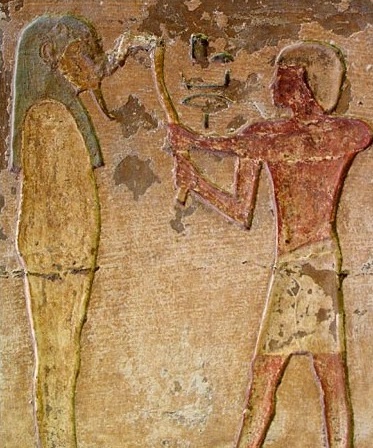 So, the “Hand to the Mouth” (Djat Ra) in Ancient Egypt could also refer to that gesture done in the Opening of the Mouth ceremony by the sem priest in the New Kingdom and maybe the embalmer in the Old Kingdom for symbolizing the new birth of the deceased. A gesture for helping him in his breathe. It is also relevant to notice that, according to the scenes of the New Kingdom, the sem priest opened the mouth’s dead with his little finger just before the performance of the professional mourner, whose mourning rite was devoted for giving “rebirth” to the dead. The first breastfeeding of the dead as a new born. The opening of the mouth for helping him to breathe.